Looking for an acupuncturist may be a daunting experience for some people, but it doesn’t have to be if you know what to look for. The best way to find a good acupuncturist is to ask your friends and family for the name of a practitioner they’ve had a good experience with. But if that’s not possible here are 4 important points to remember when interviewing an acupuncturist in Cleveland for the first time. 1. Where did they receive their training? Make sure your acupuncturist attended a nationally accredited school. 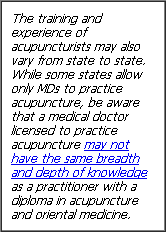 In states with strict licensing laws, acupuncturists must have completed four years of training and passed rigorous national and state board exams. But, in other states, less qualified people may legally practice. Some states require passage of the national certification exam administered by the National Certification Commission for Acupuncture and Oriental Medicine (NCCAOM) to be eligible for state licensure. NCCAOM specifically requires graduation from an ACAOM accredited or candidate program to be eligible to sit for NCCAOM's certification exam(s). 2. Do they offer a FREE initial consultation? Before scheduling the appointment, make sure they offer a FREE Consultation. This is important so you have an opportunity to determine if acupuncture is right for you. Remember to make a list of questions the day before your FREE Consultation so you get all your questions answered during that initial visit. 3. Are they open on Saturdays? Look for an acupuncturist with flexible hours. There may be times when your schedule will not permit you to get that needed treatment on a weekday, so the flexibility of getting treated on a Saturday is very convenient. 4. Do they have more than one treatment room? An acupuncturist operating 2 or 3 treatment rooms instead of 1 has increased capacity and the flexibility to get you in on short notice. When you are in pain or have to get that much needed treatment, this alone can make the difference between getting in today or getting in next week.